The #future of #textbook technology will transform #ed much like technology transformed #UPS and #Fedex and the transportation industry. When I worked at UPS on their initial E-Commerce team at their HQ in Atlanta, I had drivers all over the country tell me they would never give up their paper delivery records for a computer to record delivery info and capture signatures. Now, I don’t know any that would give up their DIAD (Delivery Information Acquisition Device) without a fight. 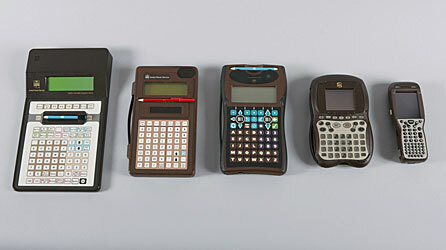 A visual history of the UPS DIAD from 1991 till 2013. The same will be said about teachers and textbooks over the next decade. The vast majority of school districts still use paper textbooks. A decade from now the vast majority will use electronic textbooks only, that are always connected to the Internet, at school, at home, and everyplace in between. Paper will be nowhere in sight and be thought of by teachers as UPS drivers think of their old paper delivery records. The article below from today’s issue of the Chronicle of Higher Education highlights some of the initial technology changes in the industry as we take the initial steps to move from paper to a technology based education experience that will replace the textbook as we know it. Technology enabled a complete transformation of how UPS thought of itself and its relationship with its customers. The same transformation will revolutionize the education industry. A revolution that has already begun. #ACE highlights in a paper released today the many ways colleges continue to neglect adult learners. There are significantly more non traditional adult learners trying to obtain a degree in the United States today than traditional learners ages 17-25. Yet the vast majority of institutions of higher learning are failing in addressing the needs of this large and diverse group of adult learners. Today the American Council on Education (ACE) released a paper that highlights the many areas our nation’s system of education is failing the adult learner, and provides meaningful insight and recommendations on how to address the needs of this vast audience. Bring in non-academics from the workplace to improve teaching and learning for nontraditional students. Encourage colleges to embrace rather than resist new types of credentials that don’t originate in academe. Rebuild the Definition of postsecondary education from the post-traditional learner 0ut. Be entrepreneurial, not merely “stewards” of current practices. 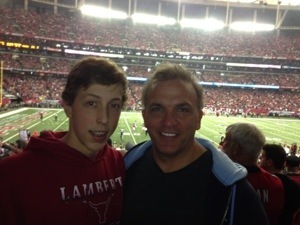 Zac and I at the NFC Championship Game. This is what the #future of #learning looks like. At University of Phoenix we started online learning in 1989…24 years ago. Most institutions are just now starting to offer their first online courses, over two decades later. Our new program, the Innovator’s Accelerator, is what the future of online learning will look like…available today. The Innovator’s Accelerator brings world-class content and a unique online competency-based learning model together with broadcast-quality production and design from global design and innovation firm IDEO and University of Phoenix, to create the next step forward in online learning focused on innovation. Three of the most prominent minds in the innovation field – Clayton Christensen at the Harvard Business School, Jeff Dyer at Brigham Young University and The Wharton School at University of Pennsylvania, and Hal Gregersen at INSEAD – tapped into their globally recognized research, experience and insights to create the intellectual core of the Innovator’s Accelerator at University of Phoenix. Take a look at an overview here: http://www.innovatorsaccelerator.com/. It’s just four minutes and well worth the time, or click on this link to take a more detailed look: Innovators Accelerator Overview from Bob Elz. What will education look like in 2025? 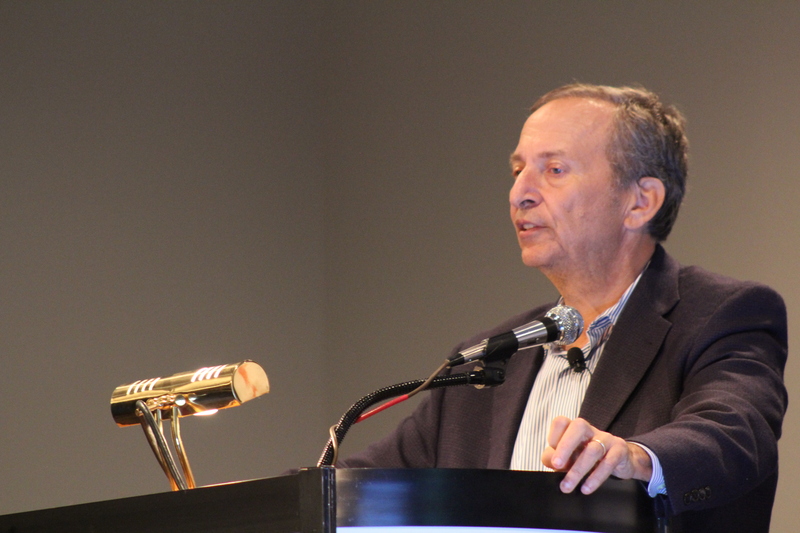 5 predictions on the future of #highered and #ed from #2013CES and #innovation conf from Dr. Lawrence Summers of #Harvard. As I met this week with leaders from the world’s largest technology organizations at the 2013 Consumer Electronics Show, including Google, Samsung, Verizon, Microsoft, LG and Intel, it is clear that the higher education industry will be radically transformed over the next five years. This transformation will not come from within the education industry, nor from government regulators or accrediting agencies, but from a generation of students that have grown-up mobile and are now entering the workforce. They are creating game changing solutions, many of which I experienced first hand this week, that will be incredibly popular with students and teachers under 30. Their adaption of these new education solutions will completely bypass the traditional decision making and procurement processes of colleges and school districts around the world. As an educator I see it all around my classroom already… Youtube, Wikipedia, Kahn Academy, LinkedIn, Twitter, Facebook, 4G LTE, Coursera, over a million apps for Apple, Android, and Microsoft devices, and of course the disruptive beauty of Google. All of human knowledge is available instantly to anyone with a mobile device, but we still run our education systems as if this was not the case. Memorization of facts, figures and formulas for the primary purpose of performing well on a standardized test is the absolute norm in education today. We treat each student as if they were in a bubble, test them from within that bubble and prevent them from collaborating with their peers and accessing the data that will always be instantly available to them outside their imaginary education bubble. Then we measure their intelligence by how they fill out bubbles on a standardized test as if this is an accurate measure of intelligence. It is singularly an accurate measure of how well their teachers teach to the test. Standardization has taken over education. A one size fits all approach that is damaging our nation in ways that have the potential to shake our nation to its core. Historians will look back on this time and document that our most important industry as a society, the education industry, was the last industry to embrace meaningful technological reform. The sliver lining here is that this reform is going to happen, but it will happen to the education industry, not come from within the industry, government regulators or accreditors. Much like the automotive industry of the early ‘70s, the music industry of the last decade, or the publishing and advertising industries of today, radical changes are going to completely transform education within the next five years. And this brings me to Dr. Summers and his predictions from CES this week. Just a little about his background if you’ve not met him. Dr. Summers is currently a Professor at Harvard’s Kennedy School of Government, he previously served as President Obama’s Director of the White House National Economic Council, President of Harvard University, Secretary of the Treasury under President Clinton and Chief Economist of the World Bank. Dr. Summers predicted five things he believes will radically transform education. The boundaries between school and work will be far less sharp than they are today. The material students use to study will be completely different than what is used today. Instructional material will be developed which will involve much greater economies of scale, much larger audiences, and much more personalization. Education will be a more varied ecology. There will be much larger institutions than are the norm today, with significantly greater personalization, with many smaller niche education institutions than today. Progress in technology and brain science will lead to abundantly more personalization to how individuals learn and preparation of lessons for the way each individual learns best. The attendees at the 2013 Consumer Electronics Show will be the ones that create and embrace these innovations, in many respects they already have. The students and teachers under 30 are already embracing these solutions, going around the traditional bureaucracy in education, they are creating the future of learning. 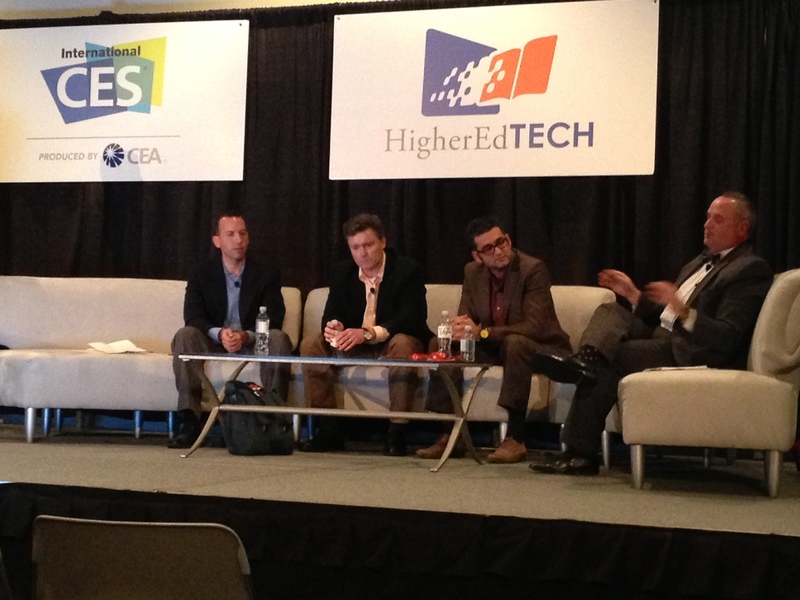 #Bigdata in #Highered at #2013CES, can it transform #ed? Mike Sharkey (Director of Academic Analytics at University of Phoenix), Jim Ambach (SVP CourseSmart), Babur Habib (Co-Founder) Kno and Mark Sarver (CE eduKan) discuss how big data can revolutionize education in our society. Can our education systems know as much about our children as Google and Amazon do? If so, how would our system of education change?